Points scored for getting there cheaply. Just weird enough, build your shelter and let be be finale of seem with the thought in mind that seem is seemly enough to be inviting. Pat people on the head. Be nice or leave, all that. And for my UK folks, we can compare notes. Not that you're not invited, FFS. I propose North Carolina as a location. [+] ...in the parking lot of The Church of No Pants! We should have the US one in Lewes, and the UK one in Hell, Michigan. Or if centrality is your aim, howabout Iceland? Would it only get half-burnt? You're on the wrong page, [ling]. That one you're looking at is the U.S. 2011-2012 budget proposal. Do we get to set fire to anything yet ? At the risk of being serious, and based on my prejudiced view of the zeitgeist in various US states... S. Dakota or Colorado. North Carolina *IS* a location. It's right above South Carolina. But is it flammable ? Yes. Thanks to kudzu, it'll grow right back tomorrow. Interesting idea. To stay true to the burning man approach, the majority of people should bring half-baked creations. And a lot of beer. The flammability of soil is described with an index of drought, the KBDI. 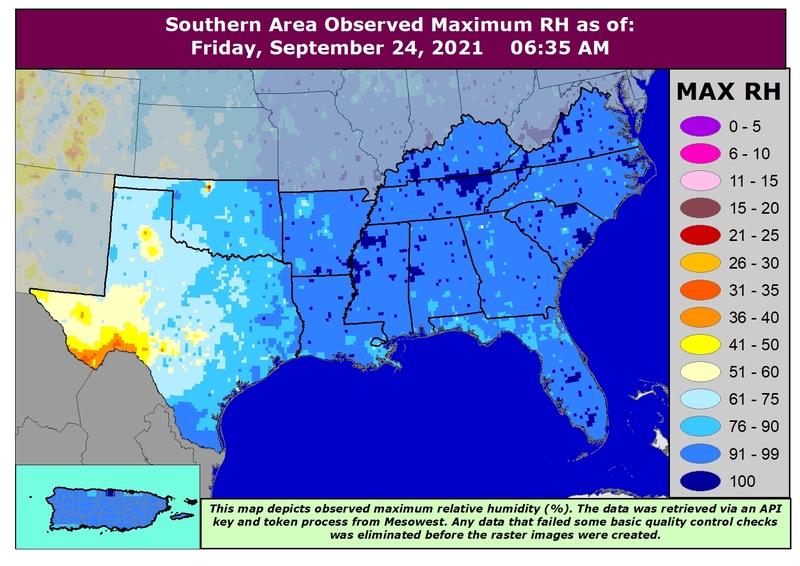 Linked is a recent map of relative humidity in the US used to generate KBDI numbers. As you can see North Carolina is quite moist this time of year. Also attached is a recent temperature map of the US. Please note that North Carolina is quite below ignition temperature. "Ah! ", I hear you say, "but what about flammable chemicals that may dry and ignite the state?" If you'll grant that any spill of sufficient magnitude as to cause significant risk of flammability will be designated a cause for alarm by the government (A "superfund" site) you'll accept the linked list of superfund sites to be a comprehensive survey of every such danger. While there are many serious problems on this list, not one of them has the enormous scale as to present significant risk. In short, North Carolina is not flammable. Therefore, the halfbaked challenge: what's the (quickest | cheapest | easiest | most surprising) method of making North Carolina flammable? Lower the price of beans at Walmart. Then light the methane. I'm afraid the evidence is that cats are self extinguishing, and therefore not a good choice. Admittedly my cat only walked into a candle once or twice, so my results aren't exactly rigorous. The hiring of a sufficient number of prostitutes, gluttons, couch potatoes, raging basement dwellers, narcissists, and scrooges and the emigration of said sinners to North Carolina may raise the number of sins to a level high enough to trigger the apocalypse and start a statewide inferno. We agree; a claasic example of poor technique. We will be delighted to demonstrate the correct way to do it.